Managing soccer tournament DEALS with URL shorteners is a quick, easy way to build value for your advertisers and sponsors. While your TourneyCentral Advertiser Module and Google Analytics will give you aggregate traffic, you may want to track individual ads or links more closely. This is where URL shorteners really shine. Let’s take a look at how to do it using the popular shortening service, bitly.com. Sign up for an account at bitly.com. I like using the @tourneycentral twitter account because I hate setting up one more user name/password account. Obviously, to log in with twitter, you need to have a twitter account. Use your soccer tournament account, not your personal handle so that your link history is part of the tournament record. Edit your profile, including an email address. Verify the address. Open your TourneyCentral Admin and navigate to the Advertising Module. Click to the first DEALS listing and copy the web address. Create your first shortened link by clicking on the orange button at the top. Paste the actual advertiser link in the Long URL box and Create. Copy the shortener URL into the Advertiser record in your TourneyCentral Admin and update. Over at bitly.com, eit your shortened link to include a DEALS tag and title to make building reports easier. Now, when advertisers or sponsors want to know how their DEALS placement did or when you need to go back for a renewal ad for next year, you’ll have data. URL shorteners are also useful when advertisers or housing services give you URLs that are long, unwieldy or complicated with non-alphanumerics. When you run them through a URL shortener, it cleans them up smartly. Managing soccer tournament DEALS with URL shorteners; it’s a tool that every Advertising Director should have in their tournament toolbox. Most websites have way too many pages! A website today is not the sum total of everything your tournament is online — a very different way of looking at websites from even a few years ago. The rise of social media is why your tournament website should be smaller. The website needs to give the who what where when why and be the authoritative voice for the your tournament; also, for operationally critical data (sponsors, applications, schedules. The other media stuff needs to live on the outposts like Facebook, Twitter, Instagram, Periscope, Snapchat etc with the website simply validating the authen- ticity of the content. The outposts are where people live now, wanting your tournament to meld into the rest of their lives, not the other way around. Your online schedule is a hook for media where you can hang photos, videos, profiles, blog posts, etc. A schedules immediately gives your media context, i.e., who, where, when, why. Use that organic context to your advantage. The absolute hardest part of shifting to social media channels is convincing folks to let go of about 90% of the website pages. You just don’t need them! Your tournament is now mobile and real time. Your participants, their fans and your supporting commu- nity is not waiting until they get home to look up scores, searching for photos, etc. They are doing that in real time as they experience your event. Because social = mobile, you should be staying on the mobile apps as much as possible, even signing up for accounts using them. For some — like Instagram and Snapchat — there is no web site; everything is done through the app. Running a tournament is all about making the best choice for what works for you. While it would be great to be everywhere on every social media channel, it’s probably not possible. Here is the list of social media channels in the order of priority that I think you should be working. In a year, this list may change but going into the 2016 tournament season, these are it. Our advice: At minimum, the modern tournament should be fluent in the top four channels to be visible. How much you want to work each channel depends on the manpower you can direct into each. Some of the content to these channels can be automated, like scores and news updates. Important: Implement the social media tools in order and completely. For example, don’t try using Vine or Periscope if you haven’t yet set up a Twitter account. It will frustrate and scatter you. Don’t get so hung up on the volume of people using specific social media channels. It doesn’t matter if one billion people are using Facebook if only your guest teams and local community are willing to connect to your tournament there. Focus on building your networks where it makes most sense to you. It is better to do fewer channels more deeply than to be everywhere but anemic and unfocused. Broadcast and interact like everyone in the world is watching you. If you are doing it well, local print and television will ask if they can use your content. If you are doing it exceptionally well, national media will. There are also other channels that you can explore like Tumblr, Reddit, YouNow, YikYak, FourSquare, Digg, WeChat, etc. But these eight provide a strong core of social media for your soccer tournament. Keep in mind that each channel requires more time and effort to maintain and you should only start with more if you are committed to keeping up these accounts. The core skills that every information-age worker needs today to compete in the modern ecomomy are; photography, videography, writing and social media. Playing soccer on a team in a competitive league gives young people critical skills that will serve them well throughout their lives. A smart tournament can also give young adults an opportunity to hone critical job-market skills by opening up their social media accounts to them to “practice” skills they will need when they search for a job. Because there are many different channels within social media, the opportunity to bring on many people to manage different channels is almost infinite. Of course, like any good team, you will need a coach to coordinate, monitor and guide your media team. Social media has a ton of potential to add to your tournament brand but it is deceptively a lot of work. It is intense and fast-paced but you have the potential to give someone one heckuva resume reel! If you do it right, your tournament can be a competitive social media jobs training program where the best media minds can not only learn new skills but give back a deep, rich online space for your tournament event. Readers of the touchline are quite familiar with our advocacy of using social media for soccer tournaments. I love the electric energy that comes with our events pushing the social media envelope, and @NASABuckeyeCup and @StrawberrySoccr are killing it! Along with updating scores on twitter as they were updated on the website, the Buckeye Cup also promoted their vendors on site. Take a minute to scroll through their twitter timeline, but the coolest thing I woke up to on Sunday morning was a pancake vendor. A pancake vendor! The Buckeye Cup also linked its twitter account to its Facebook page so updates to twitter were also posted there, giving participants a choice on how to follow the real-time action. 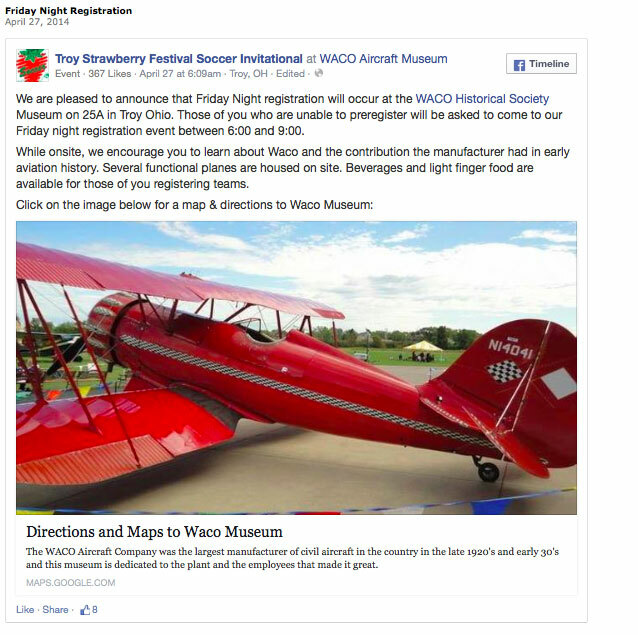 When the Strawberry posts a Facebook post, they grab the code to share it and post as a news story on their front page. That way, they can share the photos and post in many venues and they cycle in and out based on the dates of the news story. Here is what a sample looks like on the front page. You can check out the entire front page on the Strawberry Soccer website. These are just some social media examples for soccer tournaments that we hope will spark your imagination. We can’t wait to be surprised by what else you will do with your event.